Innocent until proven guilty? Not anymore. Geneva conventions preventing torture? Not anymore. Privacy from government invasion? Not anymore. For the current President, “enforcement of the laws to restore public order” means to commandeer guardsmen from any state, over the objections of local governmental, military and local police entities; ship them off to another state; conscript them in a law enforcement mode; and set them loose against “disorderly” citizenry – protesters, possibly, or those who object to forced vaccinations and quarantines in the event of a bio-terror event. Martial law might be the Dictator’s newest tool in his belt. Pentagon is ready with plans to implement martial law. Just like it happened during Katrina, you are liable to have your weapons confiscated. So much for that constitutional right. So, President Bush is—line by line, precept by precept—turning the office of the President into a dictatorship, with total control of the country. His bold actions are seldom reviewed by Congress, and he alone can determine who is an “enemy combatant”, or what constitutes a “national emergency”. And if he doesn’t like a piece of legislation, he uses a dictatorial signing statement to say if he will or will not obey a certain portion of that law, or what he thinks it should mean. Whatever happened to a government with checks and balances? Where’s the balance? Who’s checking? Each step was so small, so inconsequential, so well explained or, on occasion, ‘regretted,’ that unless one understood what the whole thing was in principle, what all these ‘little measures’. . . must some day lead to, one no more saw it developing from day to day than a farmer in his field sees the corn growing. . . . Each act. . . is worse than the last, but only a little worse. You wait for the next and the next. You wait for one great shocking occasion, thinking that others, when such a shock comes, will join you in resisting somehow. —Milton Mayer, “They Thought They Were Free. The Germans: 1938-1945. Is that photo real? What is the source? Haha, no, it’s a fake. Found it here on Flickr. So much of this power Bush seems to be collecting about himself as an individual (for all that it is in the name of the PotUS). Connor, what do you forsee for all of this when his term is up? Do you see future presidents eschewing these laws which are of questionable constitutionality at best or do you see them embracing them, and even pushing the limits yet a little further? One would think that given their time in office is limited, they would be reticent to create too much dictatorial power, as they will only weild it for a short time and thereafter would find themselves at the mercy of it…? Does anyone have any idea why Bush just bought 97,000 acres of land in Paraguay? Apparently, between him and his dad they own over 2% of the land in that nation. Connor, what do you forsee for all of this when his term is up? This is what scares me. 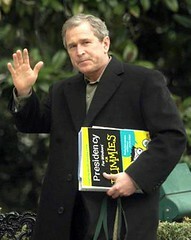 Bush has two years left, and who knows who will come after him? Keith Olbermann raised an interesting point in one of his recent shows telling Bush that he better be scared when he gets out of office, because then these laws he’s passing can be used against him. Frankly, I see these type of powers expanding, and the executive hoarding, using, and abusing more and more power. The scriptures, words of the prophets, and pattern throughout history all indicate to me that it’s only going to get worse. Orwellian, you might say. One would think that given their time in office is limited, they would be reticent to create too much dictatorial power, as they will only wield it for a short time and thereafter would find themselves at the mercy of it…? I just finished last night the book None Dare Call It Conspiracy (which Pres. Benson recommended during a general conference). This book shows that it doesn’t really matter who is in power—Republican or Democrat, both would have their cabinet stuffed with Council on Foreign Relations members who have one goal in mind: word government. It’s not so much Bush who is pushing for executive power, it’s the higher-ups and “shadow” men who are pushing us towards a North American Union, and ultimately a world government (complete with world currency, world tax, world judicial system, and world police). Bush, sadly, is one of many pawns in the hands of men such as the Rockefellers and the Rothschilds to shove us down the slippery slope we are currently sliding down. Does anyone have any idea why Bush just bought 97,000 acres of land in Paraguay? If you had knowledge of what America would soon be facing, wouldn’t you do the same thing? :) It’s also of note that his new land is a few miles away from the U.S. military base. Groups like the CFR (secret combinations) control our government. Bush is just the talking head, controlled by them. These secret groups are influenced by Satan and his power, therefore all succeeding presidents after Bush will be under Satan’s power. The answer does not lie in political manipulations, it lies in each and every one of us – – to keep on keeping the commandments. Bush and his shadow leaders are truly satanic, and mainstream Mormons need to wake up to that ASAP. I’m with you kelly, but what does the CFR stand for? Connor, I have a question…how do you justify supporting Romney in ’08 (which I think you do, judging from your sidebar link to RunMittRun), when he aligns himself so closely to Bushes policies regarding ‘war on terrorism,’ homeland security, etc. It seems like Romney is making no secret of the fact that he would follow in Bush’s footsteps in this regard. I would like to vote for him, mainly because of his business acumen, which seems to have carried over to his governorship in Massachusetts (i.e. going from huge deficit to huge surplus), and I admire his fiscal conservatism. But, the closer he aligns himself to Bush, the more uncomfortable I get about supporting him. Thoughts? Excellent question. In recent months I’ve come to question my support for Romney. His support for the so-called “war on terror” and his semi-socialist health care mandates make me waiver. I agree that he’s an excellent businessman—look what he did w/ the SLC Olympics. Sadly, federal politics often boils down to compromise and give-and-take. I don’t like that one bit. Somebody who is firm—stubborn, even—in his/her ideals can’t make it too far in politics. Compromise, or the lesser of two evils, is often the name of the game. What scares me most is that there are rumors going around that Jeb Bush might run as his veep, if Romney does indeed run (which I think we all know he will). I will NOT vote for another Bush being in office. This seeminly family-controlled executive branch is ridiculous. That’s also why I wouldn’t ever vote for Hillary Clinton (among many, many other reasons). Time for some fresh blood in our government. Career politicians must go. Ditto on not voting for H. Clinton or J. Bush…that would be practically a quarter century (more, if either were reelected) of two families splitting the executive branch (a branch which is wielding more and more power, by the way). You’re right, of course, about having to make compromises in politics, especially at the national level. I don’t know if that’s what Romney’s doing, or if he sincerely is that enamored of Bush (and his policies). Politically, it’s smart, though, as he seems to be positioning himself as a contrast to the more centrist McCain.